#SpendItWell Marks and Spencers are today urging the nation to turn their four daily autopilot decisions into more enriching choices, to say ‘no’ instead of defaulting to ‘yes’, to make decisions that count. Maybe this is the day you say ‘yes’ to leaving work on time and indulging in quality, make believe play with your little Princess. It’s so easy for us to rush about on autopilot in our daily lives in the digital, 24/7 world we live in. Yet often, what brings the most pleasure, total pure contentment and happiness, are those precious moments that no money can buy. The best things in life really are free. So today we challenge you to get back to basics and indulge in some quality make believe, pretend play with your own amazing Princess. Ideas for any Princes out there will follow tomorrow! Your own little Princess or Princesses – let the children decide if they want to dress up. Mum’s can don a tiara and some sparkle too! A Princess Mask. Get creative with your little Princess and make a Princess mask. Click here to download a Princess mask template and get those creative juices flowing! Every Princess needs some cake! Pinterest is full of inspiration of how to decorate your Princess cupcakes! BIG Imagination! Imagination is more important than knowledge (Albert Einstein!). Let the children indulge in their magical, make believe worlds. 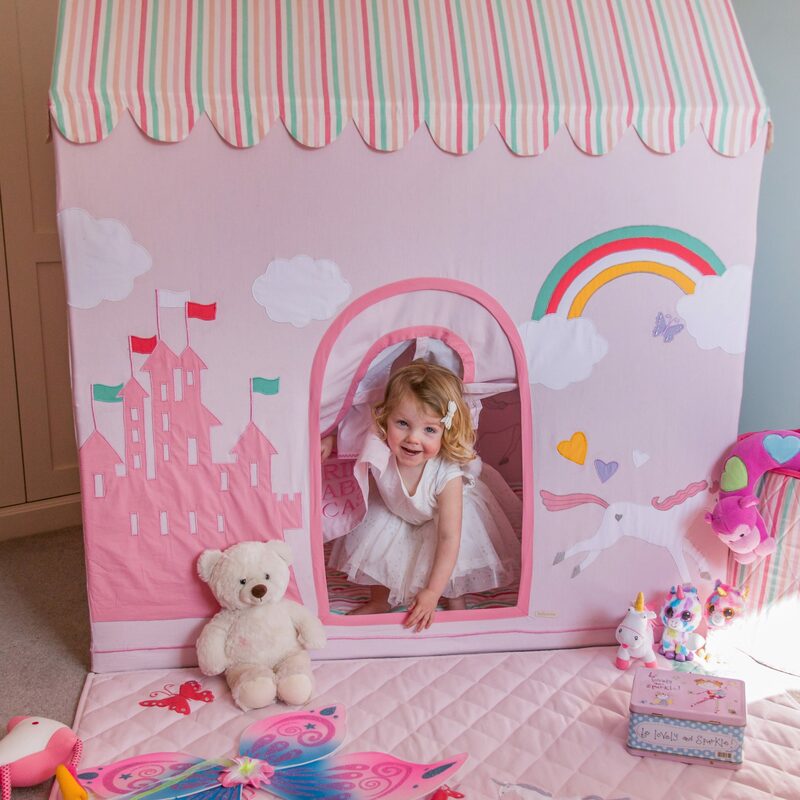 A Kiddiewinkles Princess Castle and Unicorn Playhouse provides the perfect nucleus for imaginative play. Measuring 165cm tall adults can fit in too! 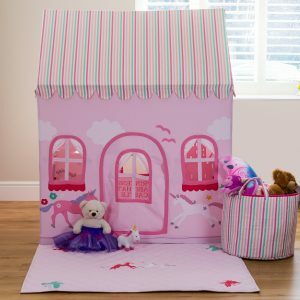 The front of the pretty pink playhouse is adorned with a majestic pink turreted castle, with flags flying, to announce royalty is now in residence. A brightly coloured rainbow peeps out from white fluffy clouds as unicorns frolic within the castle grounds, manes shimming silver as they chase the butterflies through the flowers. To make the playhouse extra special it cane be personalised with a child’s name(s) or phrase of your choice beautifully embroidered onto the front door such as PRINCESS TABITHA’S COTTAGE, PRINCESS TABITHA, TABITHA’S COTTAGE A co-ordinating floor quilt and toy storage basket are also available to complete the look. Take a look at the 360 rotation here. Quote 20% OFF PLAY at the checkout for 20% off any of our delightful playhouses.